Is Alzheimer’s disease more common in males or females? According to the Alzheimer’s Association, of the more than 5 million people 65 and older who have been diagnosed with this form of dementia, 1.8 million are male while the other 3.2 million are female. That means that nearly two-thirds of seniors in the U.S. who have Alzheimer’s are women. It’s twice as prevalent as breast cancer in females, a shocking fact considering that the rate of Alzheimer’s is expected to continue to grow rapidly as the baby boomer generation gets older. While it’s irrefutable that the female population is more severely affected by dementia than men, the medical community is still largely baffled about the precise relationship between women and Alzheimer’s. Dr. Shirley Newell, Chief Medical Officer at Aegis Living, offers insights into this perplexing subject. Q. Why are women at a higher risk of Alzheimer’s than men? Answer: First of all, it’s been known for a long time that women are more prone to get Alzheimer’s than men. It was thought to be related to the fact that women live longer, but when they really looked at it, it turns out that people who are the equivalent age, like in their 80s, there’s really not a higher proportion of women than men. There could be multiple reasons, and there’s been a lot of hypotheses about why more women have Alzheimer’s than men. One thing they know from the genetics standpoint is that women who carry the APOE e4 gene – and about 20 percent of the population has this in varying degrees – are more prone. There’s equal chance of men and women having this gene, but the women who carry it are much more likely to get Alzheimer’s. They also know that certain factors make them much more vulnerable to getting the disease. It may be related to estrogen but it’s unsure just how it’s related to estrogen. Some of the trials have found that estrogen replacement by itself without progesterone actually made women more vulnerable to Alzheimer’s. But then again, the timing of the estrogen is important. It’s when they get estrogen right as they go into menopause that it seems to mitigate the risk somewhat. Whereas if they take estrogen later in the course of their menopause it doesn’t really seen to help. Certain forms of estrogen certainly are worse for women, such as Premarin, which is an older form of estrogen that women used to get. It may have to do with the way that they burn energy in their brains and the way their brain metabolism is structured. It may be related to depression, because there’s a higher percentage of women with depression than men. There’s a lot of relationships out there but no hard facts. Q. How does Alzheimer’s affect women differently when it comes to caregiving? Answer: Women are about 60 percent of the caregivers for people who are suffering from Alzheimer’s. They tend to hold onto the people they care for longer, and it’s a challenge for them both physically and professionally. Often, they’re working women and they may have to call in more because they have emergencies that arise, they’re often late to work and they have to take time off. Many of them have to leave their careers. Often times they have children as well to take care of, so there’s a so-called “sandwich generation” – caring for their older parents as well as their younger families, so this is an additional burden. Financially, they have more stress, especially if they’re caring for a husband who was disabled early on or at a younger age before they were in retirement. They may not have the financial resources to cope if they have to stay home and not work. And there’s the emotional burden because they’re oftentimes isolated in their homes with the people they’re caring for. They may not have community or family resources to rely on and no one to rely on for respite care. Also, just physically, they’re unable to keep up with the demands of giving full care to somebody who may need help with lifting, toileting and bathing, especially if they don’t have any additional help in the household. Q. 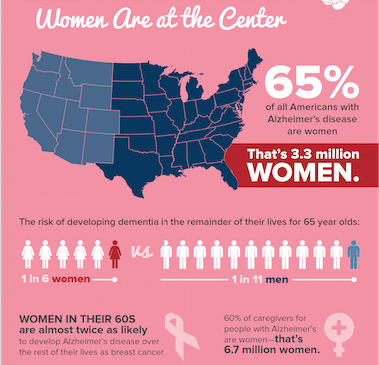 What should women be doing to take care of themselves and prevent the onset of Alzheimer’s? Answer: Women can focus on prevention – what’s good for the heart is good for the brain. We know that adequate exercise, good nutrition and sleep are critical for avoiding diabetes and heart disease. We also know that it’s critical not to smoke and to avoid substance abuse, particularly alcohol. So these things can promote brain fitness. We also know that building up a cognitive reserve for women, especially with active lifetime learning – there are certain types of learning that are better than others – can build up a reserve so that the disease is less devastating once it is established. Learn more about caring for a parent with dementia by visiting the Aegis Living community near you.